XiShu Garden Inn, Chengdu, Chiny : Rezerwuj teraz! We are a central located hostel in Chengdu. 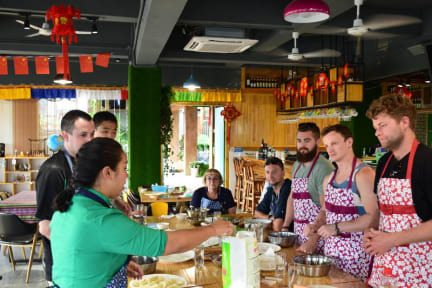 Every staff working here have a huge passion about traveling and many of them equipped with extensive experience as well. We know you travelers well. We know what you want and we know what you need. We are trying our best to provide homelike and cheerful atmosphere here to make you feel comfortable just like you are seeing the world at home. Our room is newly renovated and fully equipped. We have different types of rooms to suit your needs. Dorms for travelers on a budget or seeking for travel buddies. Twin rooms and double rooms for travelers who want some privacy. Triple rooms for friends who are travelling together. We have family rooms and our special themed rooms as well. We have a great location which is near the metro station and walking distance to many interesting places in Chengdu. And we have a super cozy roof garden with a great view to the old part of Chengdu and People’s park. We offer broad food and beverage. Welcome to stay with us, let us be part of your unforgettable Chengdu journey.